Pretty simple really. Put together by Pascalle Burton. I’m in issue #8 right opposite Emily xyz. Brisbane misses her. 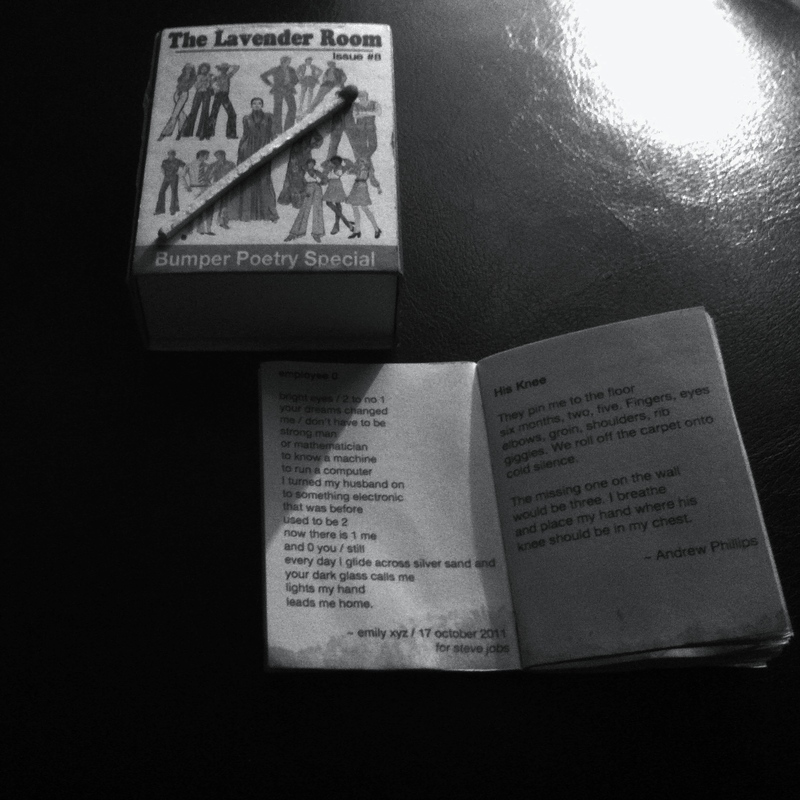 Go to The Lavender Room to order a copy or back issues. To get your copy coffee stained like mine, see Vanessa Page in a silly mood. I’m stoked to announce the Queensland Poetry Festival 2012 is launched and rolling. It is looking to be a cracker event and among the incredible line up of international and local poets performing, this Piedhillprawn will be a part of the event for the first time. On Sunday 26th August 11am, I’ll be performing with Tiggy Johnson in the ‘Storm and Honey’ session in the Shopfront Space. This is a collaborative project we’ve been working on over the past year. Don’t miss it. The session also includes the set ‘MC Lady Lazarus vs. DJ Thought Fox’ which is certain to be explosive. Yep, page poets and stage poets for the full experience in the shopfront space. A Million Bright Things is the showcase on Saturday night 8pm where Queensland Poet in Residence a.rawlings launches the Queensland focussed component of her series Sound Poetry and Visual Poetry. This will be followed by a short set from every performer on the program. Not to be missed. Also performing at QPF this year is Robert Adamson, who ‘has fished the Hawkesbury River for poems for more than four decades’. I love Adamson’s work and am super excited to be able to see several performances from him. There are so many more so go and check out the program for yourself. See you there.